Although behaviour is generally very good throughout our Academy, consultations with pupils and parents informed us that our existing systems should be clearer and more consistent. 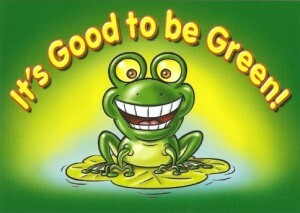 We have listened to what you told us and the result is ‘It’s Good to Be Green’! This system is already in use in lots of schools with great success. The system is based on rewards and consequences and is followed by every class in the school so that it is fair and consistent for all children. Children who follow the school rules will receive rewards and those that choose to break the rules receive warnings and consequences. Every day, every child will start ‘on green’ – this is marked with a green card on a class display. The aim is for your child to remain on green throughout the day. So if your child tells you that they have been green today, don’t worry they haven’t been ill, it means that they have followed the rules and chosen to do the right thing! If a child shows especially good behaviour or attitude to learning they may be awarded a ‘frog’ which is marked in a special individual booklet. As the expectation is that all children will remain on green all day, frogs will only be given out for very good effort or behaviour. This means that it may take your child a while to save up for a prize and the Superstar prize is likely only to be awarded at the very end of the academic year. In addition, class totals of frogs will be also be collated and the class with the highest number will be awarded in outstanding learning assemblies with ‘Fiona and Fernando the Frogs’. If pupils misbehave or do not follow the school rules they will be given a verbal warning from their teacher and will be supported to change their behaviour. If the misbehaviour continues the pupil will receive a Stop and Think card which will be placed discretely in front of them. If the pupil’s behaviour still does not return to expected standard an amber warning card which will be placed over the their green card in the class display. The teacher will then explain what the child needs to do change their behaviour and get ‘back to green’. Five red cards Meeting with parents / carers and SLT and indefinite Behaviour Report with weekly review. Parents / carers will be updated following review. At all stages, the SLT may direct a pupil to remain inside for a supervised break and / or lunch time. Teachers may also direct pupils to remain inside for a supervised break and / or lunch time if they have not completed sufficient work during learning time. Further information on the full system can be found in the school’s Behaviour Policy which can be found on the Policies pages of this website.